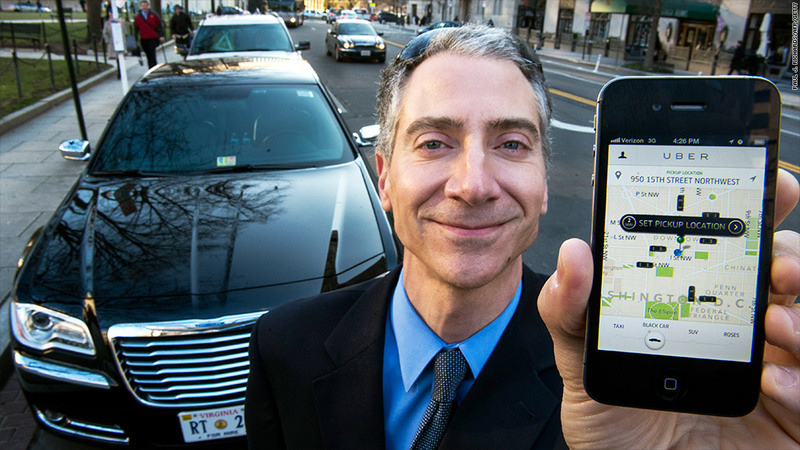 Uber's app allows customers to request rides from nearby taxis and limousines, bypassing traditional taxi services. Need a taxi in a hurry? The Uber app will get you one. Need a last-minute delivery? Uber can do that too. The fast-growing company is considering a big push into local deliveries, after experimenting in U.S. cities over the past year with a service that brings ice cream, kittens, Christmas trees and bouquets of roses to customers with very little notice. Uber has built an extensive network of taxis in 60 cities around the world, and its backers believe it could challenge established players such as FedEx (FDX) and UPS (UPS) if the firm decides to get serious. "We're in the business of delivering cars in five minutes. And once you can deliver cars in five minutes, there's a lot of things you can deliver in five minutes," Uber founder Travis Kalanick told CNNMoney at the LeWeb technology conference in Paris. Kalanick said previous delivery services were not just promotional gimmicks, but experiments in an area that could drive future growth. Bouquet deliveries on Valentine's Day were a real hit, taking husbands and boyfriends from "zero to hero" in just a few moments, he said. Ice cream was also popular. "People really lose their minds on ice cream. You become an 8-year-old all over again," he said. Since launching Uber in June 2010, the company has experienced explosive growth. Uber is reported to be worth roughly $3.4 billion, and the company boasts a number of heavyweight investors, including Jeff Bezos and Google (GOOG). The company's success has many people wondering if an initial public offering is around the corner, but Kalanick doesn't seem to be in a hurry to float, saying he wants to focus on running and growing the business. The San Francisco-based firm has built a strong presence in North America and is now expanding into international cities at a rapid pace, launching in Santiago, New Delhi, Abu Dhabi and Guangzhou in just the past month. But the company also faces challenges. Several cities are taking legal action to try to shut the firm down as they worry that the service poses too big a threat to the traditional taxi industry. "We have three attorneys on staff at Uber and then we have law firms around the world that we work with. Probably 50 different law firms," said Kalanick.